I had never even heard of “Nice” cream until recently. Who knew that just 3 ingredients could yield such an amazing dessert? So let’s start with the basics….what exactly IS “Nice” cream anyway? 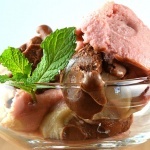 “Nice” cream is an ice cream-like frozen dessert overflowing in deliciousness! The base is always frozen bananas. From there, the flavor possibilites are endless. This was admittedly my very first (ever) attempt so I decided to ‘go big or go home’ with this Neapolitan Banana “Nice” Cream 😉 When I was growing up, neapolitan ice cream was everywhere. 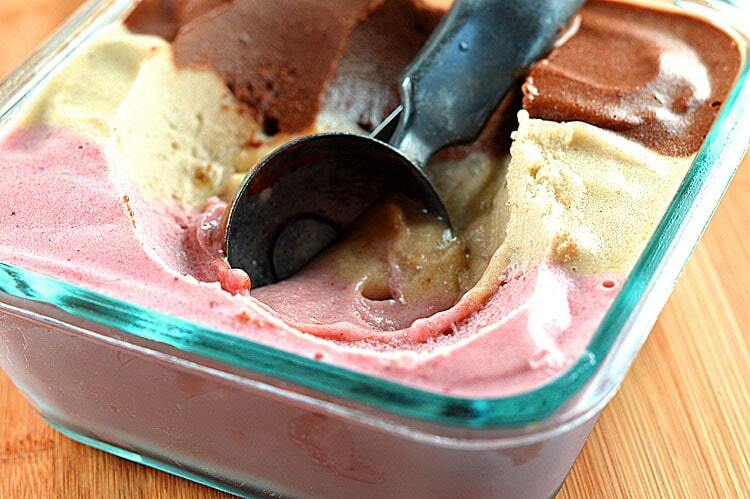 Even at school, we had these little cups of neapolitan ice cream (you know the ones with those little wooden spoons?) So I thought I’d try to recreate the concept today. Each flavor consists of only 3 ingredients. That’s it! 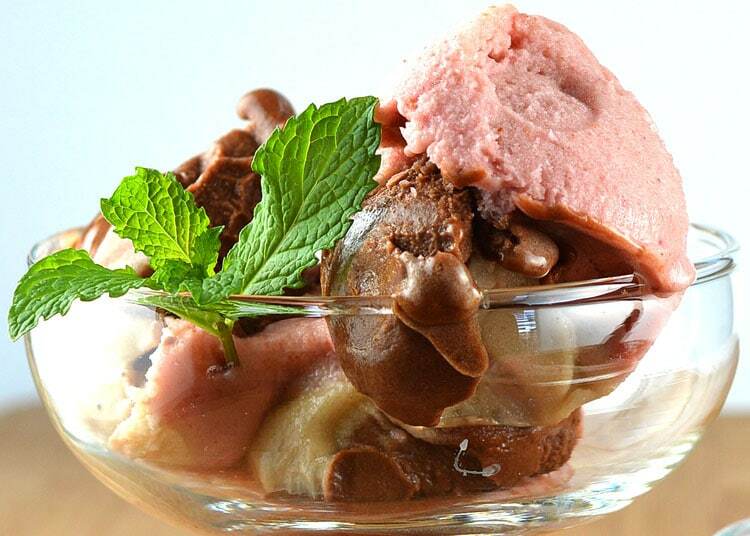 Let me first mention that you do need a high-powered blender to create this ice cream from frozen bananas. Also, the order in which I made the three different colors allowed me to merely rinse the blender quickly in between. I started with the basic banana “nice” cream. Frozen, chopped bananas, a splash of vanilla and almond milk. You could stop here and just add fruit and it would be delicious! Next came strawberry. Frozen, chopped bananas, frozen strawberries and almond milk. Lastly, my favorite. The chocolate version is merely frozen, chopped bananas, cocoa (or cacao) powder and almond milk. I freeze my bananas when they are at their peak of ripeness, so these were pretty sweet on their own. You could always opt to add dates or agave nectar if you feel the need. Also, you could eliminate the almond milk completely, but you’d have to let the frozen fruit thaw slightly. I didn’t and thus, needed the extra liquid to get the blender going. Spoon each layer into a freezer-safe dish and give it about 30 minutes to an hour before trying to scoop. Now it’s ready to scoop and serve! You can see the texture is just like ice cream. Who knew? I can’t wait to try even more flavor combinations. For each flavor, simply place the sliced, frozen bananas into a high-powered blender (I use a Vitamix) along with the additional ingredients. I first pulse the blender, tamping down the ingredients so they are at least chopped up before I start. Allow it to run for about 30 seconds and you are done! 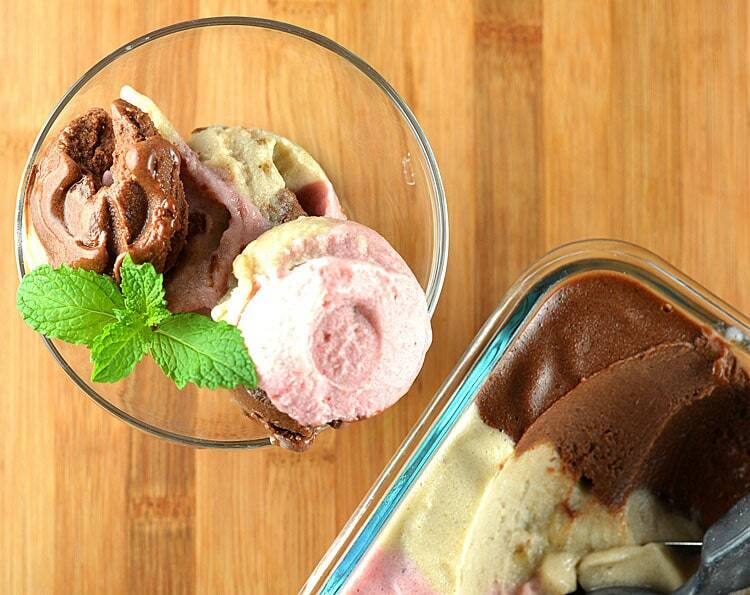 To create this neapolitan "nice" cream, simply spoon each layer into a freezer-safe dish and give it 30-60 minutes to firm up. Then it's ready to scoop.